Get to know Sophie Church, a master's student who works to preserve art and cultural artifacts. What problem do you hope to solve as a researcher and why do you care about it? My research focuses on the Renaissance period. I will begin my thesis work next year, though I plan to examine paintings or illuminated manuscripts from a technical art historical perspective. I want to help to protect and preserve art and cultural artifacts, as well as raise awareness of their importance and diversity. I think that we take art for granted, especially in today’s world where we are surrounded by images in our day to day lives. This work is important to me because as a future art conservator, I will work to protect, care, and save our cultural treasures for generations to come. Why did you pick the UA? I chose UA because I knew that there were opportunities within art conservation here. I plan to attend an art conservation M.S. program post-graduation from UA. There are only four universities in the U.S. that offer this program, so they are very competitive and require 400+ hours of lab or fieldwork experience. I knew UA had two conservators on campus, Dr. Nancy Odegaard at the Arizona State Museum and Dana Hemmenway at the Center for Creative Photography. I chose to come here in hopes of working with them in their laboratories to gain experience for my next graduate program. At the time I didn’t know that I would be lucky enough to work with both of them. Through my internships with each of their labs, I also made lots of connections with other conservators in the area and was able to network other opportunities. For example, in August I will be working with Tumacacori National Historical Park on an outdoor restoration project. I wouldn’t have had these opportunities or made these connections if I hadn’t chosen to come to UA. What do you like about the process of doing research? I like handling and touching the art objects, which may sound silly, but in museums you can only look at works from a distance, behind rope or glass. As a conservation intern, I am able to handle and study art objects up close. I can feel the textures of the surface and its physical mass. It’s a very different experience from studying art works on the internet or in a textbook. It’s also exciting to learn about a work of art in a class lecture and then go to the museum and see it in person or even handle it in one of the laboratories. Once you got to the UA, how did you get started in research? What are the steps you took that got you to where you are now? I was very lucky to meet the right people at orientation. During our tours of the museums on campus, I made sure to introduce myself not only as an art history graduate student, but as someone interested in art conservation. Conservation is a very small field, so it can be difficult to find people and make connections, but once you do, you become a part of a very close community. My first internship was with Dana Hemmenway at the Center for Creative Photography. I started this internship back in September of 2017 and I’ve continued it throughout this summer of 2018. 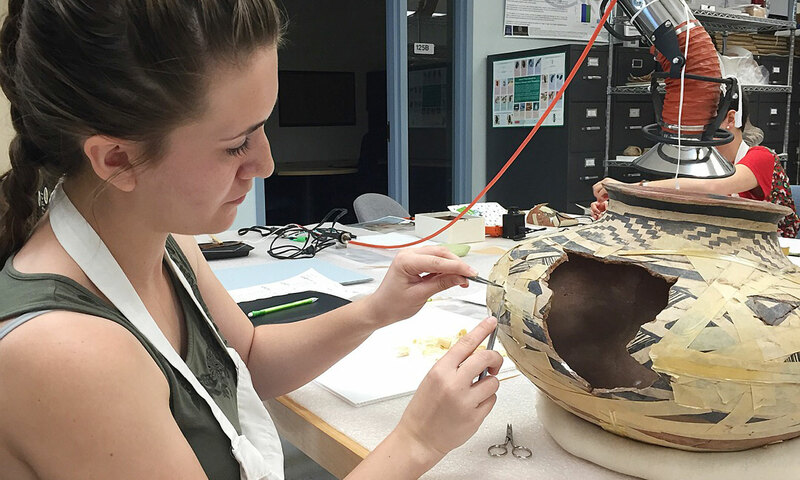 It was from this internship that I was able to make connections with the Arizona State Museum and intern with Dr. Nancy Odegaard in her preservation lab. Then from that internship with the ASM, I was able to meet people who work with the National Park Service’s Western Archaeological and Conservation Center here in Tucson, and so on. All it took was one person and one opportunity to open all these other doors for me. What or who inspired you to enter this field of study? At the time, I believed them and decided I wanted to be a veterinarian. My sophomore year I took biology and decided it was not for me. I then tried digital art with the goal of becoming an animator. I realized I preferred traditional art because I could feel the materials. I then saw a movie in which the main character was a paintings conservator for the Metropolitan Museum of Art in New York and I thought, “That’s so cool!” I began researching on the internet what an art conservator is and how to become one. By the time I entered undergrad, I knew what steps I needed to take to enter the field, and pursued my Art History B.A. with minors in chemistry, museum studies, and studio art. Best memory at UA so far? When I chose to come to UA, the first conservator I met was Dr. Nancy Odegaard and I felt like I was meeting a celebrity. I was just so excited and nervous to finally meet an art conservator, and I had so many questions. I was even more thrilled to later have the opportunity to work with her. Pursue your passion. Money won’t bring you happiness. Your undergraduate career is a flexible time to try new things, take diverse classes, and to pursue you interests. Graduation is not a race. You’re allowed to make mistakes and change your mind. You’d be surprised how different fields work together.